I have had a few projects that have been in something that I would consider to be &apos;woodworking&apos;. Not really the stuff that is a part of the house like the stairs or the deck, but things that are created for their own sake. The first one since I moved into the house would be the picture frames I made for Christmas presents. After that was a box I made out of plywood. I use it for a piggy bank (sort of). Next in the list was... whoa.. actually it was both a christmas gift AND a piggy bank. That&apos;s kind of cool. Taikara moved into a new place and was in need of a bookcase. There was a cool one that was at target but it was 300 bucks. This is one bookcase that is in the same &apos;line&apos; as the one we saw. 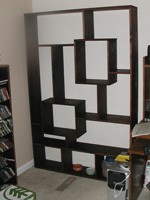 It seemed over priced, and kinda ugly, so I got to work and cranked out a plan that matched the layout of the bookcase. Now I didn&apos;t do this all on my own mind you. Kos and Taikara both helped with lots of the work. It was fun to get to make something like this. I now have a good chunk of experience doing tricky layouts and making it look good! So here&apos;s the plan and the final product. Colors in the image represent different boards. It was initially meant to be made with five 4&apos; and five 6&apos; 1x10 pine boards but there weren&apos;t any 4&apos; boards at the store. Instead I used three 8&apos; 1x10s four 6&apos; 1x10s. Stained with Minwax Red Mahogany. 102 black cabinet screws. I bought some 90 degree clamps. They were life savers! I really liked this project. So even though it&apos;s not mine to keep I thought I would share!